Natalia FN Bittencourt is a Sports Physical Therapist, Ph.D. in Rehabilitation Science. Currently, she is the Head of Sports PT Department of Minas Tenis Club (Brazil) and has been responsible for organizing the Preseason Assessment of 1000 youth athletes from 8 different sports (volleyball, basketball, indoor soccer, judo, gymnastics, swimming, and tennis) for ten years. 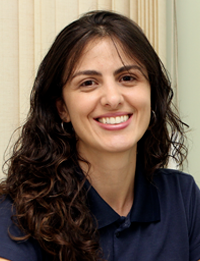 Also, she works as Adjunct Professor at University – Uni-BH and she is on SONAFE’s Executive Board (Brazilian National Society of Sports Physical Therapy). She worked as Sports PT of the Brazilian Women’s Volleyball Team – Under- 20 for five years. Her main research topics are: 1) Preseason assessment and sports injury prevention, and 2) Application of complex system analysis in Sports Science. Finally, she helped to develop a Sports PT application (app) aimed to improve the assessment process.